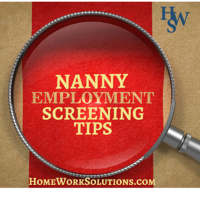 Effective Nanny Screening - Free Download! The safety of your children trumps all other matters related to hiring childcare. A thorough background check of the person you are considering is imperative. Even if she comes recommended by a friend or family member, screening a candidate will provide peace of mind and help you make the best choice for your family. How to detect fake references! Fill out the quick form at the right and we will email this to you immediately. Send Me Tips on Nanny Screening!